The Cavs Start to Figure it Out? Cleveland’s recent successful road trip, and their most recent win over fellow Eastern Conference contender Chicago in particular, offers hope that the team might be starting to come together. The game ended 108-94 and Chicago were missing their lynchpin, Joakim Noah, but the Cleveland Cavaliers starters all scored in double figures, led by a LeBron James rejuvenated by his recent lay-off to rest up knee and back issues, to leave the United Center with a victory over a Bulls side that is still fancied to make the NBA finals next summer. Among those starters, the Cavs had three double-doubles: they got 15 points and 12 boards from Kevin Love to go with Timofey Mosgov’s 15 and 15 and Kyrie Irving’s 18 points and 12 assists. The Cavaliers, after wins over both LA teams and the Bulls, now sit at 22-20 after recently falling below .500 for the season with some speculating that they might even struggle to make the playoffs. The departure of Dion Waiters, bringing in Iman Shumpert and the much-maligned but undoubtedly talented J.R. Smith, spoke to the lack of cohesion in the locker room and rumours about the future of coach David Blatt began to circulate. This would have been all-too familiar to LeBron James. During his first season in Miami, similar stories about locker room dissent and dissatisfaction with inexperienced coach Erik Spoelstra emerged and many were quick to speculate that Spoelstra might be replaced by team President Pat Riley. 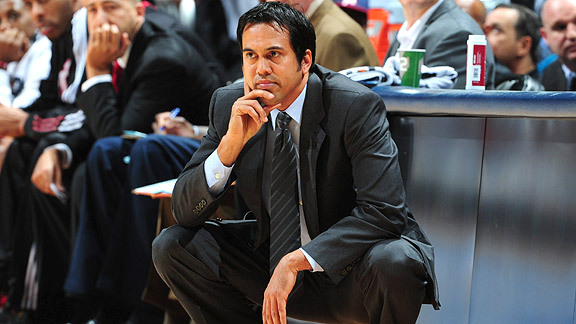 Spoelstra had, of course, led the Heat to the playoffs in each of his first two seasons, with 43-39 and 47-35 records, before losing to the Hawks and Celtics in the first round of the playoffs. The arrival of James and Chris Bosh in 2010 brought with it expectation of immediate titles and, following a 7-7 November (0-4 on the road), the team began to figure things out in December, going 15-1. History shows that the team more than “figured it out” and were convincing throughout the playoffs until the finals where they lost 4-2 to the Dallas Mavericks. The expectation of this new Cavaliers team with the returning king pairing up with his “new big three” partners of Kyrie Irving and Kevin Love, both incredibly talented players but neither quite at the level of 2010 Dwyane Wade or Chris Bosh, were similarly high. If this recent road trip, with LeBron back in the lineup, is anything to go by, Cavs fans may now have more reason to be optimistic.